The records of Big Joe Turner have been coming fast and furious these last few months – it seems like only yesterday we reviewed another effort of his on the Down Beat label in fact – but that hardly was something that was cause for celebration. None of these releases were exactly flying off the shelves and coming out as they did on different labels, all trying to appeal to slightly different markets and with each session seeing him backed by different musicians who had their own specialties factoring into the work, it’s no wonder that Big Joe Turner was something of a lost soul in the late 1940’s. The boogie woogie craze he and pianist Pete Johnson had instigated in the late 1930’s when they burst onto the scene at the famed Spirituals To Swing concerts in New York, which they then parlayed into long engagements at the top society clubs around the Big Apple, had waned once World War Two came about and while Joe remained steadily working and recording, first for major label Decca before landing at National Records where he scored two hits mid-decade, his fortunes since then had declined as the black music scene headed in many different directions at once leaving him with no natural allegiance with which to make his stand. It didn’t help that Turner was more than capable of succeeding in almost any one of the styles that were springing up, something which sounds odd to say – that he was hampered by his versatility – but because each record label would have their own ideas as to where he was best situated stylistically he had better succeed with it right out of the gate so as that company would lock him up long term to continue to pursue the same direction, or another label who won his services would have a recently successful blueprint with which to follow on their own material with him. When that didn’t happen however, the records never connecting on a wide enough scale to give some indication as to which audience was most receptive to him, it meant that he’d jump from one style to another depending on the whims of whatever label he was recording for that day. Each release therefore may sound nothing like what came before it, nor would it have much to do with what was to follow. That’s hardly a proposition for building a reliable reputation with a prospective listening audience. 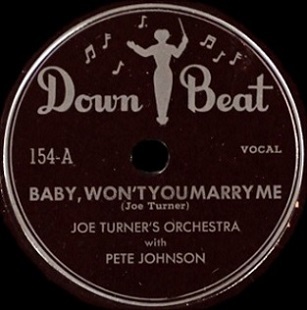 So here he is back for another go-round with Down Beat, a small but fairly high-minded label in Los Angeles, the city where Turner was now situated more or less full time, playing clubs around town, and paired up with his old pal Pete Johnson on piano for this double session from June 28, 1948, which resulted in eight songs being cut to be spread out over four singles. But “spread out” is the wrong term. Oh how wrong it is, because they were consecutive releases on Down Beat, meaning no other artist had anything issued in between them and chances are they were put out one right after another over a matter of a few weeks – let’s say eight weeks at the most – thereby giving none of them much chance to build any word of mouth build up to help sales, or else they were all issued simultaneously, probably in December considering one of them (the record slotted just before this one) was a Christmas record. Needless to say flooding the market with releases by an artist who wasn’t exactly making much headway lately to begin with, and also doing so at the same time OTHER labels – namely MGM and Excelsior – were in the process of releasing their OWN records on Turner, one after another, meant his chances to have any one of them get picked out by the clientele was as unlikely as Big Joe sticking to his New Year’s diet resolution beyond the first weekend in January. Since six of the eight sides cut for Down Beat were jazzy in nature, and since the band was the same on all of the songs and had sunk the chances at his other effort on the edge of the rock realm – Wine-O-Baby Boogie – you can probably guess that the chances Baby, Won’t You Marry Me is unlikely to break the string of creative and commercial disappointments. Right away the offending parties from the last record, namely the outdated horn section, announce their presence on the intro, drowning out Johnson’s more spry piano in the process and surely sending a good many listeners then, and readers today, in search of more exciting pursuits. I don’t blame you. But for once I don’t blame them. Not exactly anyway. As stated Down Beat was clearly thinking of Turner in a more upscale setting for these sides as a whole and whether that had been determined by the personnel they’d enlisted to record behind him, or if they had this approach in mind when they signed Turner – as if there was an actual contract! 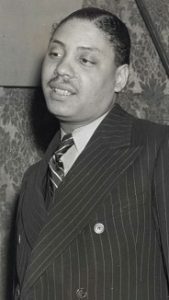 – and therefore intentionally sought out musicians who specialized in this type of playing I don’t know, but when analyzing his output on that date it certainly indicates that these horn players were the engine driving the Big Joe Turner bus. With that said we can safely report that it was the WRONG bus they were all on. Even on the more suitable material he laid down with them, including a rehashing of his eternal chestnut Old Piney Brown Is Gone they hardly distinguish themselves much with their playing. It’s not that they’re anywhere near as bad here as they were on Wine-O-Baby Boogie where they clashed mightily with Johnson and Turner, but they aren’t giving Joe any riffs to support his hefty frame. Theirs is a thin tone played with indifferent effort, the sound of going through the motions without any emotional commitment to the singer or the song. But again I’ll lay off their professionalism a bit here as well because Turner himself follows up his own lyrical missteps that plagued “Wino-O” with a fluffed line right out of the gate, as he can’t remember whether to call his hoped-for future bride “gal” or “girl” and sort of splits the difference. Whatever hopes you had that the last single had been just a fluke goes out the window here and you shake your head and lower your already low expectations even further. Maybe it’s those sinking hopes that make the middle stretch of this seem like a ray of sunshine on a rainy day, as Turner’s enthusiasm picks up a little as the horns settle into a more unobtrusive role playing a brief and to the point circular riff that while hardly worthy keeping around at least isn’t grating on your nerves anymore. As Turner expounds on the benefits of having plenty of women after him (WHY they’re after him is left intentionally vague, probably because he doesn’t want to admit they own the last hotel he ran out on without paying his bill or perhaps are with the finance company and about to repossess his car), the story picks up. Joe’s always in good form when he can boast a little because unlike most singers he’s able to do so without being off-putting or sounding full of himself. Here he delivers lines like “When things are going great the chicks move right on in” so that you don’t begrudge him his pride, especially because he couches it by not insisting this is a permanent condition like his buddy Wynonie Harris would surely do. All of this is helped immeasurably by the ever-reliable Johnson playing between the cracks during the verses and then taking a nimble solo which benefits even more by the fact the horns drop out altogether during the middle eight. When they return however it’s as if the inspiration has all been used up by Johnson as the horns start tossing in some flighty passages – never taking over the track but certainly not doing it any favors – and Turner’s own focus seems to wander once again. Though he never quite loses himself as he did on Wine-O-Baby Boogie where he was tripping over his own tongue during the last half of the record, here he’s doing all he can just to stay on his feet. He manages it I suppose, I mean you never hear him crash to the studio floor swearing up a storm, but it’s not the smoothest of deliveries as he tries to keep one eye on the storyline floating through his subconscious and the other eye on the exit so he can beat a hasty retreat after failing to come up with anything too promising at yet another record label. At this stage of the game Turner is riding the bench, lucky to still have a uniform on the rock team. If not for the exemplary outing on Excelsior with I Don’t Dig It he’d be a candidate to be cut from the squad altogether, sent back to the minor leagues or into early retirement. Yet it’s not as if he’s embarrassing himself completely even when the results are somewhat sloppy and uninspired as they are on Baby, Won’t You Marry Me. There are moments in most of these creative failures where you sit up and take notice of his delivery at crucial spots, the way he nails a line with authority, or perfectly times a pregnant pause and hits the right emotional button on cue. To continue on with the sports analogy he’s like a player whose had a long road back from injury whose legs aren’t quite under him yet and whose timing is just a bit off. He still knows HOW to play – or in Joe’s case how to sing – yet he needs more reps in practice to get his game back to where it should be. What he also needs, and this should be plainly obvious to anyone with ears, is a set of musicians who are more well suited for the type of material he has to pursue in order to climb back into relevancy. Though in June of 1948 they might not have quite been able to tell for sure that rock ‘n’ roll was his ticket back to the top, by the time this record hit the streets as the calendar to 1949 the evidence should be overwhelming. Not only was rock the fastest growing commercial market in black music by now but it also was built on the very things Turner himself had foreshadowed for years – a romping uptempo pace over which he could wail like no tomorrow. All he needed was the right circumstances to bring that back out of him, yet with each passing month the likelihood of that happening grew ever dimmer. Since we know how the story ends – with Big Joe climbing that mountain again and reigning supreme – there’s no suspense in the outcome, but as of this moment, when these desultory sides on Down Beat were struggling to earn their spot on a single jukebox in the most Turner-friendly environment you might come across, the real existential question to ponder is what would’ve become of Joe Turner if he’d kept swinging and missing each time out? Would that once mighty voice be silenced forever? Thankfully we don’t have contemplate that for too long, but in January 1949 it certainly had to have been foremost on Turner’s mind. Leave a reply on "Big Joe Turner: “Baby, Won’t You Marry Me”"